Michael Jordan's good at a lot of things: basketball, building apparel empires, smoking cigars. But if there's one thing he absolutely needs to work on in the future, it's the way he dresses on the golf course. A couple months after Jordan wore an awful getup to the Ryder Cup that caused a minor stir, the greatest player to ever lace up a pair of high-tops is back in the news again for, you guessed it, the way he was dressed on the course. According to the New York Post, Jordan showed up at La Gorce Country Club — a high-class course in Miami Beach, Fla. — wearing a pair of cargo pants for a round of golf. No big deal, right? On most occasions, wearing a pair of cargo shorts for a round at your local muni track is acceptable, but when you're playing at a swanky club in Miami, you're expected to wear a pair of khakis that don't have baggy pockets. 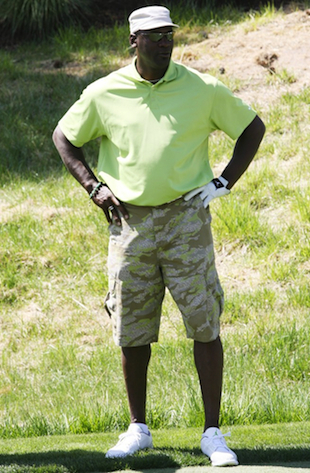 Apparently Jordan didn't get the memo and showed up to the course sporting cargos anyway. Well that didn't sit well with La Gorce's membership. "Michael was wearing cargo pants on the course," said a spy. Jordan's multipocketed pants were apparently against the dress code that, sources say, dictates that members and guests must be attired in a collared shirt and Bermuda shorts. But when 6-foot, 6-inch Jordan was offered a chance to change outfits, he demurred. "He was given the chance to change but he didn't want to," a source said. The source added that Jordan, who was enjoying a round at the club with one of its members, played on anyway. The source added that members complained about Jordan breaking the rules and, "He won't be invited back." A rep for Michael Jordan told the Post that, "Michael Jordan did wear cargo pants . . . He had been there many times before and had worn cargo pants previously, and had never been made aware that he was violating any dress code. This time, he was made aware of the violation on the 12th hole, and at that point . . . he did refuse to interrupt his game, and return to the clubhouse and change. We were not aware that he is not allowed to return to La Gorce. I guess it's their loss — as MJ is a great golfer, and a great guest." The club did not respond for comment. Honestly, I'm a little surprised the club didn't let Jordan's fashion faux pas slide. After all, we're talking about Michael freakin' Jordan and, as you can see from the photo, he's been known to wear cargo shorts on the course in the past. If he's done it before, chances are good he's going to keep doing the same thing in the future, because, well, he's Michael Jordan. But hey, if a club has rules, everyone has to follow them — even if the rule breaker happens to be a living legend. Next time bring a pair of Bermuda shorts to the course, Mike.